On Your Mark, Get Set, Paint! The 2nd Annual “Paint the Point,” sponsored by Arts Mineral Point (AMP) kicks off tomorrow, August 5th and runs through Saturday, August 8th. AMP expects over fifty artists to take part in three different competitions. In the Main Event, artists will set up easels and paint from Wednesday morning through Friday afternoon. Then a jury of art professionals will judge the pieces the artists create. In the Nocturne Event, artists begin painting Thursday evening, August 6th, and they will paint all night until they turn in their artwork Friday morning. The Quick Paint Event starts at 8 a.m. Saturday morning. 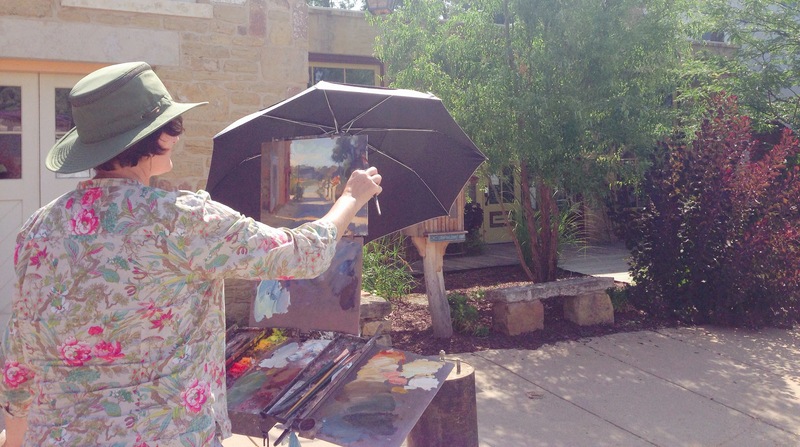 Artists then have two hours to create a painting in the downtown historic district. This year AMP also invited Haiku poets to visit the painters while they work to get the their perspective on their painting. The poets will then write a Haiku that will be exhibited alongside the paintings. The combination of the art and the art-inspired haiku is called haiga. The artists’ finished work for the Main Event and the Nocturne Event will be for sale at a silent auction from 10a.m. – 7 p.m. on Saturday, August 8th at the Longbranch Gallery, Wantoot Gallery, and 103 Commerce Street. Artwork from the Quick Paint Event will be available for sale at the Green Lantern Studio, 261 High Street after 2 p.m. This entry was posted in Art, Outdoors, Upcoming Events and tagged Art, Arts Mineral Point, Artwork, haiga, High Street, Historic sites, History, Longbranch Gallery, Mineral Point, Outdoor painting, Paint Competition, Paint the Point, Painting, Wantoot Gallery. Bookmark the permalink.